A number of England fans were taken to hospital in France following a series of clashes between football supporters in Marseille. 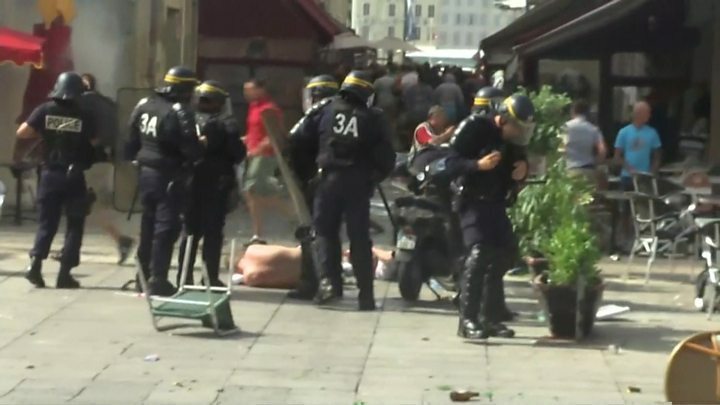 Violence has broken out between England fans, rival supporters and police for the last three days in the port city. There were also clashes in the stadium following England's 1-1 Euro 2016 draw with Russia, after Russia fans appeared to rush at England supporters. French police said one Briton had been seriously hurt in the earlier clashes. Witnesses said trouble began in the stadium after flares were let off by Russian fans near the end of the game. Some fans then climbed across barriers designed to keep rival fans apart. Russia's Sports Minister Vitaly Mutko said on Sunday: "We will have a fine from Uefa, so I understand. We behaved incorrectly," R-Sport news agency reported. But he added there were "many nuances" to what happened, and Russian officials would investigate. Ned Ozkasim, from London, who was in the stadium, told the BBC: "There was a large explosion, and after the Russian goal they started invading the area where some England fans were. "I didn't see any retaliation from the England fans - they were just trying to get away. There were no riot police at the grounds as we expected. There were just stewards in hi-vis, and they just let it happen." In the steamy, humid environment of this port city in the south of France, with alcohol flowing freely in searing temperatures and demonstrations of aggression from both sets of fans, all the ingredients were in place for events that unfolded in the Vieux-Port de Marseille. BBC sports editor Dan Roan said England fans began jumping over the perimeter fence in panic. "Big questions for Uefa here," he tweeted. "Stampede appears to have been triggered by explosion. How did such a device make it inside and where was segregation?" A senior FA security official said he had not witnessed anything like it in nine major tournaments he had attended. Kevin Miles, of the Football Supporters' Federation, said the incident came at the end of "a very torrid day for many England fans". Some fans had been attacked "brutally and violently" by Russian hooligans and locals youths, and it was "clearly premeditated", he claimed. Police had "failed entirely" to protect fans, he said. The British ambassador to France, Julian King, tweeted: "Number of Brits in hospital overnight. Consular following closely with French authorities." He added that the embassy was "reviewing the situation" with the French authorities. Shadow home secretary Andy Burnham said the safety measures and security inside the stadium needed to be urgently looked at, and called for more stewarding. Earlier on Saturday French police said one Briton had to be resuscitated by officers and was left in a critical condition. Police in riot gear clashed with England fans, and used tear gas for a third day and a water cannon to try and stop outbursts of violence. There were also clashes in the city of Nice between police and fans from Northern Ireland and Poland, who are due to play their opening match later. Six people were reportedly injured, before order was restored. Before the game fans walked past ranks of police officers in riot gear on their way to the Stade Velodrome venue. The great majority of fans appeared to be peaceful, but there were some reports of trouble between English, Russian and local fans. BBC News correspondent Nick Eardley said he witnessed bloodied England fans being "dragged away by police", to the sound of sirens blaring out across the city's main square. Police told the BBC six people had been arrested and at least five injured during the scuffles. Some British journalists in the area pointed the finger at a gang of black-clad Russians, who they said had entered the port city's main square from a side street apparently seeking violence. The FA condemned the violence saying it was "very disappointed by the terrible scenes of disorder", while European football's governing body Uefa said it "firmly condemns the incidents in Marseille". England fans are now moving on from Marseilles as the team's next match is against Wales in Lens on Thursday afternoon. Russia play their next fixture against Slovakia the previous afternoon.